Hypertension in cats is of critical importance in veterinary practice primarily because of the deleterious effects it can have on kidney function. 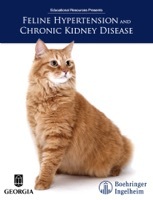 This book focuses on the importance of monitoring blood pressure to detect hypertension before organ damage occurs, identifying cats at greatest risk, the relationship between kidney disease and hypertension, and the important role of the renin-angiotensin-aldosterone system. The book also introduces angiotensin receptor blockers and how they have the potential to be more efficacious than ACE inhibitors in managing feline hypertension.